A lecture and exhibit examine the evolution of architecture over the centuries and the use of technologies in contemporary work. 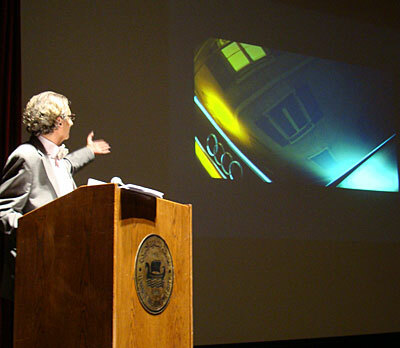 Dr. Georges Abou Jaoudé, architect and professor of computer science and representation at the Ecole Polytechnique Fédérale de Lausanne in Switzerland, presents a lecture on the role of technology in architecture. The LAU exhibit showcases photos of a large wooden model of the church of "San Carlo alle Quattro Fontane" (Saint Charles at the Four Fountains) erected in Switzerland from 1999–2003. 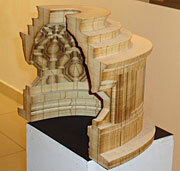 The original mock-up of the wooden model of the church on display in Sheikh Zayed Hall. Visitors examine photos of a miniature of the wooden church model on display at the exhibit. 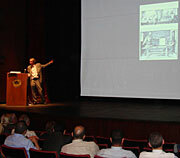 Abou Jaoudé presented dozens of slides showing examples of the transformation of architecture over centuries. Guests pack the exhibit hall following the lecture. 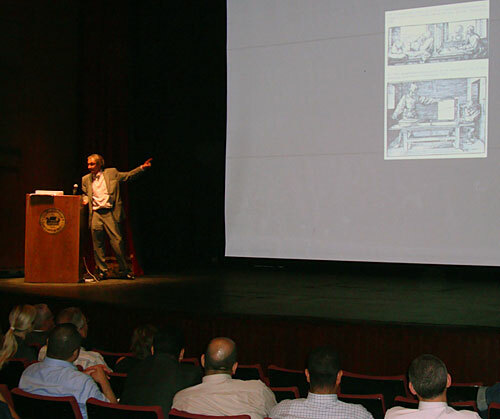 A lecture by distinguished Lebanese-Swiss architect and professor Dr. Georges Abou Jaoudé illustrating how architecture can transcend time, which was followed by the opening of a linked exhibit, attracted a swarming audience at LAU’s Beirut campus on October 20. Entitled “From Borromini to Botta: History, Heritage and New Technologies,” the event examined the evolution of architecture over the centuries and revealed techniques to preserve the “flesh and feel” of an image or architectural piece while using modern technology. “Even if you are not using a certain type of decoration, you can still have very clear references, [using] modern expression and geometry, to what we learned from the proportions and the way of doing things in the past,” said Abou Jaoudé, a professor of computer science and representation at the Ecole Polytechnique Fédérale de Lausanne, in Switzerland. Abou Jaoudé noted observations about the use of technologies in contemporary work and compared the processes of designing and implementing projects before and after the advent of computers. By explaining that through models architects can perform stress-analysis tests to better understand how to repair an injured eye, Abou Jaoudé also gave attendees a glimpse of his work on biology-related studies. He looked specifically at the physical properties of the human eye — ”This is where an architect has huge impact,” he said. 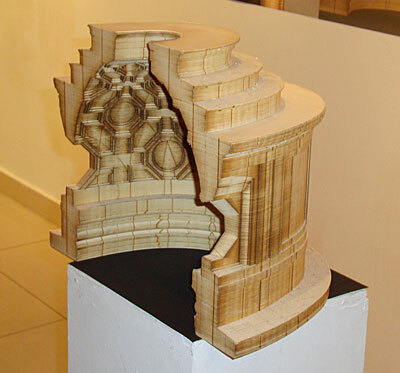 At the exhibition, taking place in LAU’s Sheikh Zayed Hall, visitors are greeted with images and the original mock-up of a wooden model of the 17th-century church of “San Carlo alle Quattro Fontane” (Saint Charles at the Four Fountains) in Rome, designed by Swiss-Italian architect Francesco Borromini. The model was chosen to embody the event’s theme because modern instruments were used to design and recreate the classical style and feeling of the original church. Standing 33 meters high and weighing 90 tons, the model was designed by famous Swiss architect Mario Botta and was displayed on Lakeshore Lugano in Switzerland from 1999-2003. 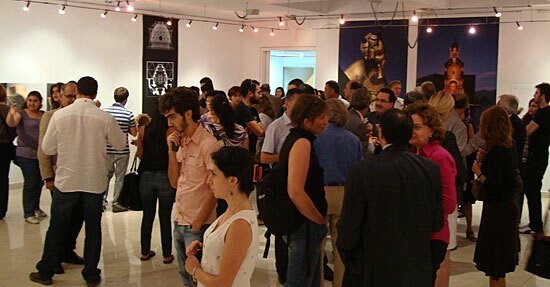 The lecture and exhibition were organized by the newly established LAU School of Architecture and Design (Department of Architecture and Interior Design) in collaboration with the Embassy of the Swiss Confederation, the Italian Cultural Institute in Lebanon, and the Ecole Polytechnique Fédérale de Lausanne. Dr. Elie Badr, acting dean of the School of Architecture and Design, gave a short address before the lecture thanking guests for their participation. “I’m very happy that this exhibit is in a way inaugurating our School of Architecture and Design,” he said. The exhibition will run until November 3 (opening hours: 8:30 a.m.-6:00 p.m.).